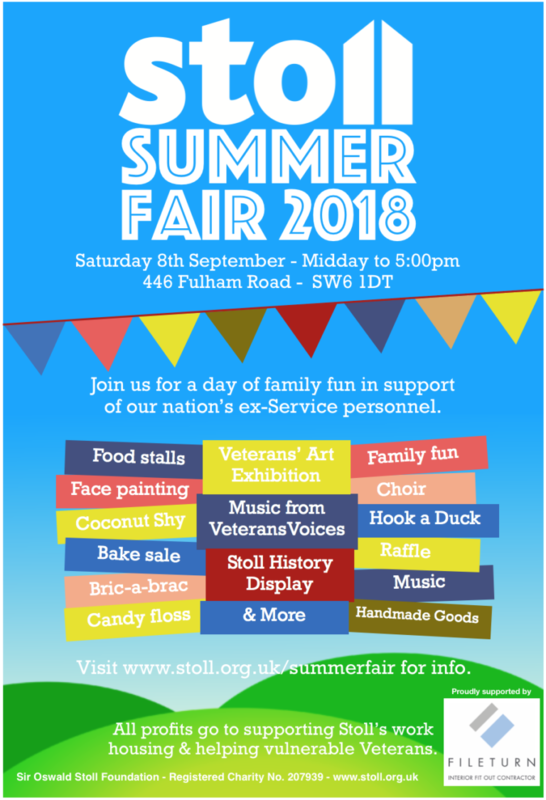 On Saturday 8th September at midday, the historic Stoll Mansions on Fulham Road will be opening its doors to welcome the local community for the first ever Stoll Summer Fair. The Fair will be a fun, family-friendly day packed with stalls, live music and activities. Stoll is delighted to welcome the Mayor of Hammersmith and Fulham, Cllr Daryl Brown and the Council’s Armed Forces Champion, Cllr Alan De’Aath. The charity Stoll has been at the heart of the local community since 1916 and is the leading provider of supported housing to vulnerable Veterans. All profits from the Fair will go towards supporting Stoll’s work to house and help the nation’s ex-Service personnel. On the day, you can expect to find stalls filled with crafts, homemade goods and bric-a-brac, as well as delicious food including a BBQ. Children and adults alike can have their faces painted or try their luck at some traditional fair games, such as hook-a-duck or the coconut shy; all polished off with a candy floss. There will also be live music from Veterans Voices throughout the day and an art display by Stoll Veterans. Stoll would like to thank Fileturn, the official sponsors of their Summer Fair. Fileturn, an innovative interior fit-out contractor, is also a founding member of Stoll’s Corporate Supporters Programme. Stoll’s Summer Fair takes place on Saturday 8th September, from 12pm – 5pm. Entry is free but we are recommending a suggested donation of £3 per person – this will ensure that we can continue to house and help vulnerable Veterans.